It took me MONTHS to actually get my Instant Pot out and use it - if this has been you - have NO FEAR! I will walk you through it step by step. Many of my recipes will use some kind of protein (e.g. chicken, meat, etc.) - so the some of instructions I have here are for meals with protein. BUT! You can of course eliminate the protein/ sauté step if it suits you. If you’re making a meat (or chicken, etc.) spray your pot with an oil spray so that you don’t ruin the pan. When you are prepping your ingredients (chopping, etc.) press “Sauté” on the Instant Pot so that it heats up - even if you won’t be sautéing anything, this function shortens the time your Instant Pot will need to heat up before the timer starts counting down (more details on that later). Sautéing or browning your meats (red meat, chicken, etc.) will often be the first step if your recipe calls for a protein. Browning your meat this way will give it a crispy outer texture. You can season the meat and press the seasonings into the meat before starting to brown it, to add more taste. One of my favorite seasonings is garlic salt! Brown for just about 5 minutes - turning a larger piece of meat over once halfway through or stirring frequently if you have smaller pieces. Always use a wooden spoon to save the bottom of your pans. Step 4: Add in your other ingredients, and close the lid. Turn the knob to “Sealing”. It won’t switch functions otherwise! Many recipes will tell you to set a manual time (versus, honestly, using any of the rest of the buttons on the Instant Pot!). After pressing “manual”, adjust the time based on the recipe. Remember, the Instant Pot has to heat up or “come to pressure” before the timer actually stars coming down. So don’t worry that the timer doesn’t automatically start counting down! Many recipes will tell you to do a “quick release” - which means that you are the one releasing the pressure - or moving the knob from Sealing to Venting. Make sure 1) there is a lot of room between the ceiling and where the steam will be released (where the knob is). You don’t want any water damage to cabinets! And! Make sure 2) you are far away from the knob so that you don’t burn yourself when the pressure releases - a lot of HOT steam will come shooting out. You can turn this off whenever you like. 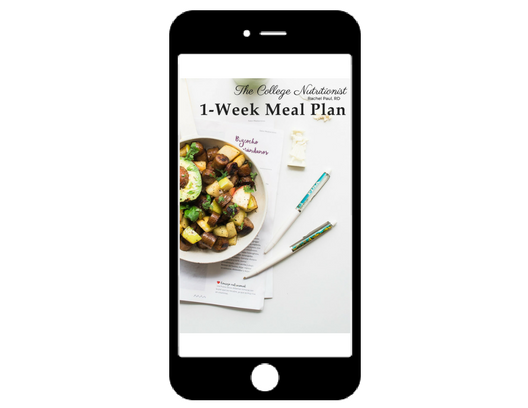 All of these recipes make 2 servings and follow my lunch & dinner formula to make them super filling, satisfying, and healthy! There will be extra liquid - you can discard it!